The Junior League of Washington Holiday Shops Grand Opening is an exclusive shopping event featuring crowd-favorite silent and live auctions. For its 60th year, we will return to Dock5 in Union Market. Throughout the evening, guests are invited to bid on fabulous items in the silent auction, including spa packages, unique getaways, tickets to major sporting events, and so much more. Past live auctions have featured a weekend getaway to Forbes Five-Star luxury resort Sea Island, box seats to DC sporting events, and a private Neiman Marcus shopping and makeover party (including a $1,000 shopping spree, champagne brunch for 10, makeovers, and gift bags). This year, Holiday Shops is proud to announce a new method of bidding. Attendees of the Grand Opening Party and even Junior League members and supporters who don’t attend the event, are able to bid on silent auction items through their smartphone by downloading the app Handbid, available for Apple and Android devices. The beauty of Handbid is that you can bid on items at any time prior to the auction closing and, even better, from any location. Bidders are notified via text or push notification when they are outbid, so you do not have to stop shopping and mingling to rebid on your must-have auction items. What’s more, our Holiday Shops auctions provide vital support for JLW’s mission. 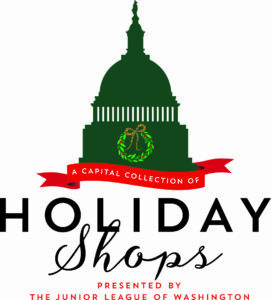 Last year, Holiday Shops raised more than $27,000 exclusively from our silent and live auctions – funds that impact our community partners, including 826DC, Horton’s Kids, and the Washington School for Girls. Check this page frequently for updates on what items will be featured in this year’s auctions! Auction donations may be dropped off at the Junior League of Washington (3039 M Street NW, Washington, DC 20007) on or before September 1, 2018. Please include our auction donation form.